Last time they met: Morningside 11.5 (71) d Surfers Paradise 9.8 (62), 2018 first semi-final at Esplen Oval. Ins: Morningside – Ash Evans, Jimmy Johnson, Tyler Hausfield; Surfers Paradise – Cassidy Haberfield, Nick O’Hare, Jack Mitchell, Nick Harrison. Outs: Morningside – Ryan Dadds (Redlands), Eddie Mallan (unavailable), Lachlan Russ (unavailable); Surfers Paradise – Rene LeFeuvre (concussion), Tom Smith (ankle), Dan Green (thumb), Hunter Pierce (ill). Triple Surfers Paradise best and fairest Cassidy Haberfield will return to the Demons firsts on Saturday after an off season getting his kicks from another pastime. Haberfield, 23, spent the break between QAFL seasons concentrating on making his debut in competitive Muay Thai and he won his first two bouts by knockout. Because of his campaign in the martial arts form Haberfield missed the opening round last weekend when the Demons beat Wilston Grange in the seniors, although he was best on ground in the Demons reserves. Now it’s back to business with Surfers, who are plotting revenge on Morningside in their match at Jack Esplen Oval, the venue where the Panthers eliminated the Coast team in last year’s first semi-final. The tough grind of training (and fighting) for Muay Thai has Haberfield fighting fit, as it were, and coach Brad Moore has no doubts his dynamic rover will be sherry ripe for his first match back. “I’m feeling fit and ready to go,” the Surfers B&F in 2015, 2017 and 2018 said. Now with older brother Brody entrenched as Surfers captain – he won the 2016 Surfers B&F – all the signs are positive for Haberfield, who won his two muay thai bouts by knockout. Both Morningside (Labrador) and Surfers (Wilston Grange) opened the 2019 campaign with victories and no doubt to go back-to-back in the first two rounds is the priority for both clubs. The Panthers will miss Eddie Mallan and Lachlan Russ (both unavailable) and have Ryan Dadds on Redland NEAFL duties. They brought back star on-baller Ash Evans, Jimmy Johnson and rookie Tyler Hausfield for his debut. Hausfield is a former Morningside colts captain who was in the Redland system last year. The Demons elected not to take risks with two of their players – big forward Dan Green and newcomer Tom Smith. Green has a thumb issue and Green is nursing an ankle, although Moore said both would be playing if it had been late in the season. “They’re a couple of nigglies and it’s only round two so we’re taking precautions with them,” he said. One would have thought that a driving mental factor for Surfers would be that semi-final loss to Morningside, at Esplen Oval, when the home side kicked the first five goals of the game and only just held on. That loss is definitely not playing on Moore’s mind. “Looking at our team on paper, we’re drastically different to that side – I think we have 12 different players and looking Morningside they’re not much different to us.” Moore said. His Panther rival Clint Watts said the make-up of this year’s sides could be a key to the clash. “We have two very different teams going to front up on Saturday, but we haven’t really brought last year’s game up,” Watts said. Last time they met: Broadbeach 12.10 (82) d Mt Gravatt 10.6 (66), Round 13, 2018, at Subaru Oval. Ins: Broadbeach – Blake Erickson, Kwaby Boakye, Connor Harris; Mt Gravatt – Adam Boon, Jack Coghlan, Jarrod Huddy, Corey McGuren, James London. Outs: Broadbeach – Xavier McMahon (unavailable), Alex Rodrick (omit), Shaye Walsh (omit); Mt Gravatt – Jasper Craven (Aspley), Kyle Walsh (Redland), Dylan Smith (ankle), Todd Carbone (unavailable), Harrison Hunken (unavailable), Ben Daly (emergency). Mt Gravatt’s new playing-coach Adam Boon has declared himself ready to go when he returns to the fray for the Vultures on the Gold Coast on Saturday. The Vultures are off down the M1 for a key engagement against season 2018 runners-up Broadbeach at Subaru Oval, a venue where they lost by 16 points last year. Boon is no stranger to Mt Gravatt, having played in the blue and white stripes for a number of years when he was listed by Redland in the NEAFL. The playing coach is one of a surprising five changes to a Mt Gravatt side that started the new season off well when they beat Western Magpies last weekend. 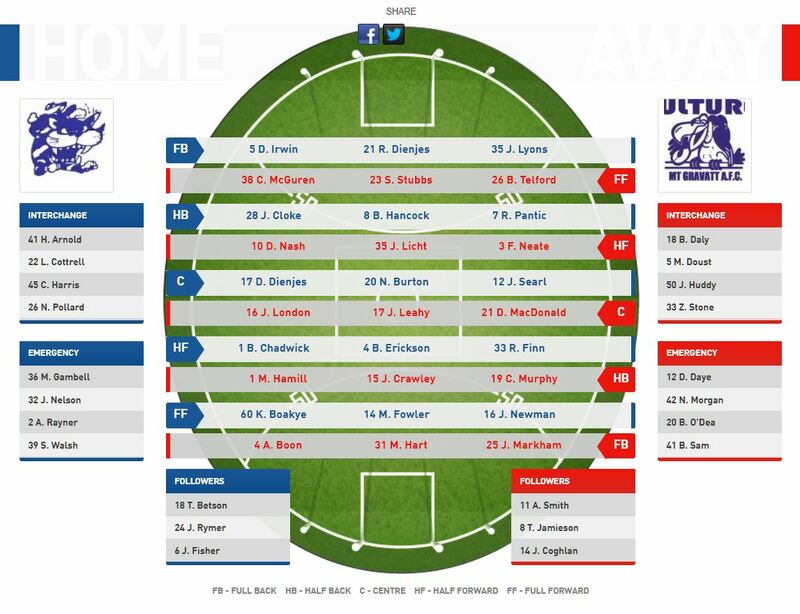 On the other hand Broadbeach, who lost in round one to grand final victors Palm Beach Currumbin, have three changes. The most important one is the return of reigning Grogan Medallist Blake Erickson, who played reserves last year after his return from, an overseas holiday. Southport-listed Kwaby Boakye, who played in the 2018 grand final for the Cats, and Connor Harris are the other two faces from the previous weekend. A big loss could be Xavier McMahon, who can fill a variety of key positions for his club. Two important losses for Mt Gravatt are Jasper Craven and Kyle Walsh, who have NEAFL commitments with Aspley and Redland respectively. Broadbeach coach Beau Zorko said the availability of Erickson is ‘invaluable’ for a side he thought played a bit like strangers when they lost to premiers Palm Beach Currumbin. “We looked a bit unfamiliar last week,” Zorko said. “We reviewed last week pretty heavily, and we found some invaluables to take away from the game. Boon has no fears about playing Broadbeach on a ground as big as Subaru Oval. “We have a good mix of inside ball winners and with a lot of speed and spread outside, so think the ground will suit our side,” he said. Last time they met: Western Magpies 12.12 (84) d Labrador 8.8 (56), Round 16, 2018 at Cooke-Murphy Oval. 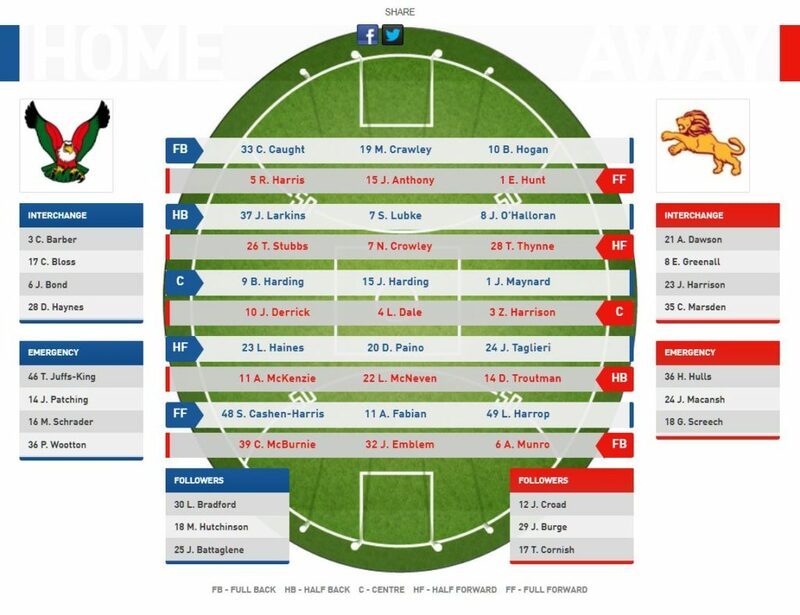 Ins: Western Magpies – Brenton Saunders, Riley Green; Labrador – Lachlan Davidson, Blake Grant, Matt Daniel. Outs: Western Magpies – Will Fletcher (ankle), Dan Edwards (omit). Labrador – Andy Hollis (unavailable), Ben Middleton (unavailable), Jacob Bottrill (hamstring). A second teenage graduate from Park Ridge’s 2018 premiership side has been named for his QAFL seniors debut for Western Magpies on Saturday. Riley Greene, a 17-year-old, is set to follow in the footsteps of his former Park Ridge team mate Nathan Colenso when he runs out for the Magpies against Labrador at McCarthy Homes Oval. Colenso, 16, marked his debut for Morningside last weekend by winning the round one Rising Star Award nomination. Both Greene and Colenso were members of the Park Ridge Pirates who won the QFA Division 2 flag last season. “Riley had a good pre-season and was probably a bit unlucky not to play in our first game last weekend,” Magpies coach Brydan Morgan said of the selection of Greene, an inside defender. Greene is one of two changes made by the Magpies, joining Brenton Saunders as new faces to the side. 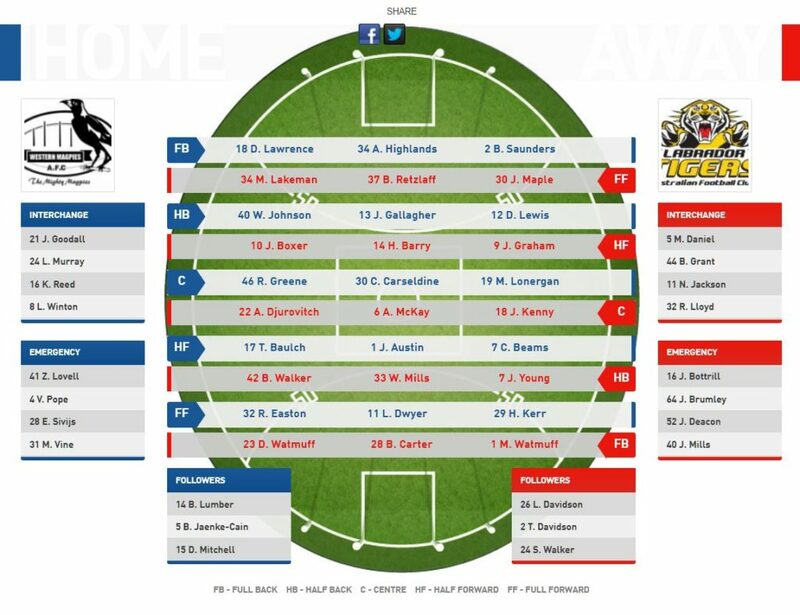 The Tigers-Magpies clash features two sides that lost in the opening round – a fact that basically ensures a nice and willing battle coming up. Out of the side are Will Fletcher (ankle) and Dan Edwards. Labrador made three changes to the side beaten by Morningside in the first round. 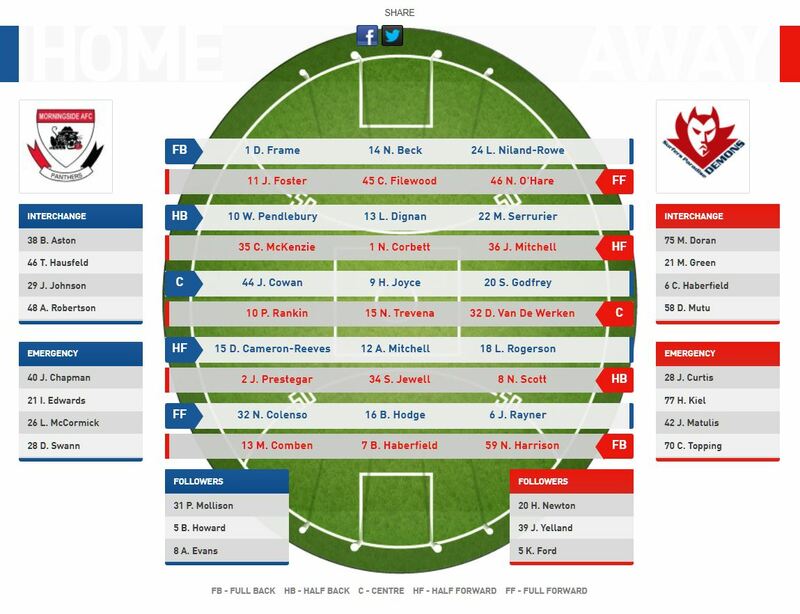 Ruckman Lachlan Davidson, Southport-listed Blake Grant and former premiership player Matt Daniel are the new faces, replacing unavailable pair Andy Hollis and Ben Middleton and hamstring victim Jacob Bottrill. The pressure is obviously going to be on as the sides chase a maiden victory for 2019. Labrador coach Liam Burke expects nothing more than a tough contest at the nest of the Magpies. “The Magpies are always difficult to beat up there,” he said. On Tuesday night the Magpies had an in-depth video review of their first round loss to Mt Gravatt and Morgan said some key areas were brought to light. “We had a really solid review on Tuesday night,” Morgan said. Against Morningside last weekend the rebuilding Tigers had their moments but cost themselves badly when they allowed Morningside to kick three unanswered goals before half-time. Last time they met: Palm Beach Currumbin 29.18 (182) d Sandgate 8.4 (52), Round 11, 2018, at Salk Oval. Ins: Palm Beach Currumbin – Adam McKenzie, Trent Stubbs; Sandgate – not applicable. Outs: Palm Beach Currumbin – Stephen Thynne (hamstring), John Macansh (omit); Sandgate – not applicable. 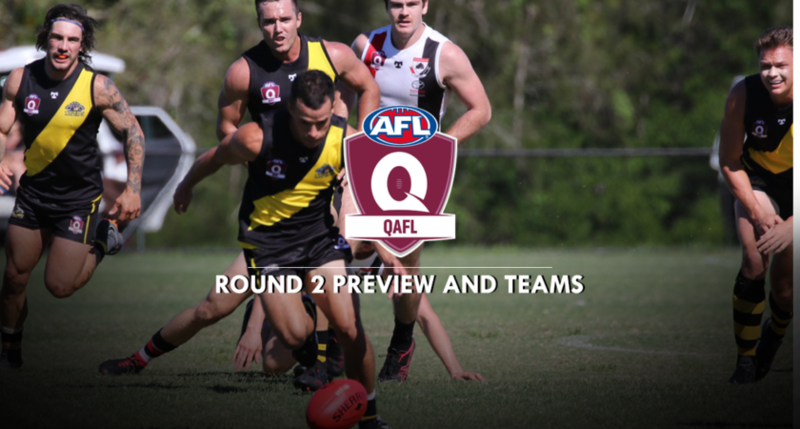 Sandgate simply have to find ways of combatting the QAFL’s most imposing forward Jack Anthony if they are to spring an upset against Palm Beach Currumbin at Lemke Road Oval on Saturday. The imposing frame of the in-form Lions spearhead forward Anthony, coming off a haul of eight goals in the season opener against Broadbeach last weekend, is clearly an issue that has to be handled well by the Hawks. The last time the sides met, in the 13th round last year, Anthony kicked 10 goals and individually outscored the Hawks, who finished the match with 8.4 (52). Sandgate coach Jarad Marsh put up a contender for understatement of the year when he described former Collingwood and Fremantle player Anthony as ‘a hard match-up’. “It’s a challenge first-up, obviously, with a young group but then again it’s an opportunity for someone to step up and play on someone I believe is the premier forward in the competition at the moment,” Marsh said. Still, never rule out the Hawks on their spacious Lemke Road ground. This is the venue where Sandgate thumped PBC, who went on to win the grand final, in the final round of the 2017 season. Sandgate named six new faces to open their 2019 campaign after the first-round bye. They are Cody Caught (former state under-16 captain from Mayne), Loki Haines (ex-Noosa and Brisbane Lions academy), Dom Paino (Wilston Grange), Tiwi Islander Shatna Cashen-Harris from the Sandgate juniors, Lachlan Harrop (Aspley juniors) and Jayden Battaglene from East Ringwood. Over in the PBC camp new captain Stephen Thynne is out for a month or so with a hamstring strain and John Macansh has been omitted. Back in the side is dual premiership half-back Adam McKenzie and a handy Southport (NEAFL) listed player in Trent Stubbs, a goalkicking onballer who was once on Collingwood’s rookie list. PBC coach Jess Sinclair has never seen Lemke road Oval but has been told about how big it is. “We spoke about the ground and we expect a tough game,” he said.